When Air & Gas Technologies started business over 20 years ago, compressed natural gas was the vision that drove the business. The business invested in natural gas vehicles with the belief that infrastructure would be built in the future. We're proud to announce that today, another Natural Gas station has been built in partnership with Chesapeake Utilities. 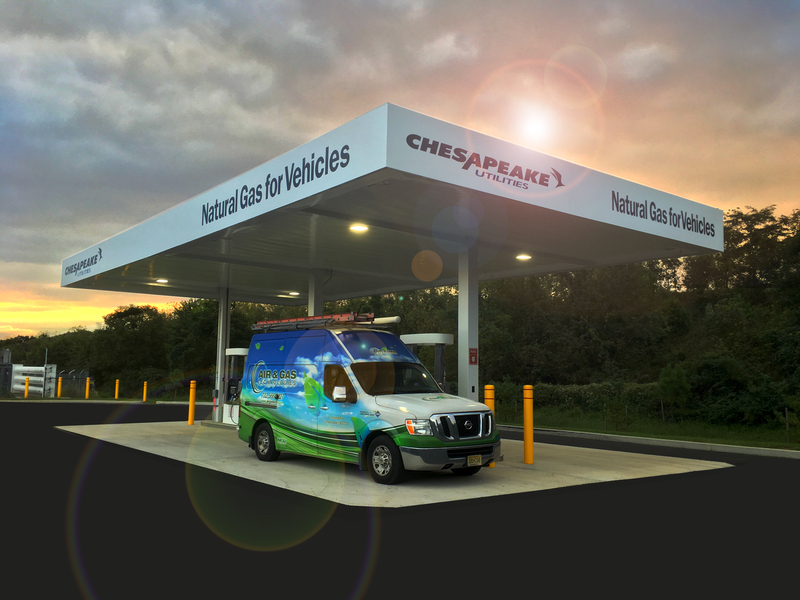 Today, Dover, Delaware has the option of filling up natural gas powered vehicles at the Chesapeake Utilities CNG station located at the new corporate locations, 500 Energy Lane, Dover, DE 19904. The station is opening for public access but will also power Chesapeake Utilities CNG fleet which is expected to continue to grow. At this time, there is a 40 cent price difference between natural gas gallon equivalents price, and gasoline gallons. Although these prices fluctuate, natural gas as an alternative fuel proves to be cheaper time and time again. These savings will be paid forward both financially and environmentally. In addition to fuel cost savings, great fuel efficiency reduces maintenance across the life of a fleet. These savings get passed onto all customers as Chesapeake Utilities is the local utility provider. Powering this station, Air & Gas Technologies provided an ANGI NG300 Duplex (3 stage) compressor skid to power the station. At the dispenser, we utilized 2 Bennett Dispenser which has 4 hoses. 2 are fleet nozzles and 2 are CT1000 standard pistol grips. This setup will allow easy fueling for the public as well as fuel for large trucks who need quicker dispensing. View the construction process from blank slate to complete functioning natural gas station.